The Tram's Ten Year Anniversary, original construction, and storm operations, in pictures. 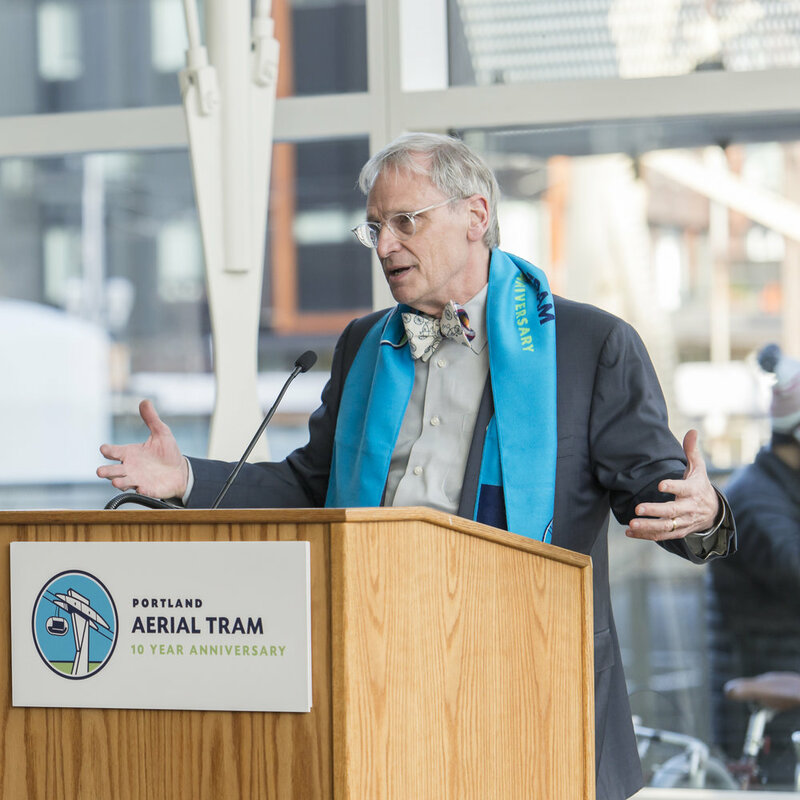 Ted Wheeler, City of Portland Mayor with Mark Bee of Doppelmayr and Brett Dodson of OHSU. Tram maintenance is performed annually to keep the Tram operating smoothly. Darlene Hooley, for whom the US Congresswoman Darlene Hooley Pedestrian Bridge at Gibbs Street is named. Apparel with the Tram's anniversary logo debuted at the celebration and will be available soon for purchase. The Tram Tower before installation. The South Waterfront Terminal under construction. The Marquam Hill Terminal under construction. In the weeks leading up to the 10 year anniversary, Portland's transportation system was shut down by historic storms. The tram was the only transportation system that was not heavily impacted by the storm and instead worked overtime to deliver people safely to work, school, and home. Although the tram can be a safe bet in snowy conditions, traveling to the tram through downtown Portland during a snowstorm is not recommended. Riders during a storm are typically people in need of or providing essential health care. When transit is impacted by weather, check GoByTram.com to see if the tram will modify operations.